NAAAP-NY is pleased to bring to you our next Networking Series event. 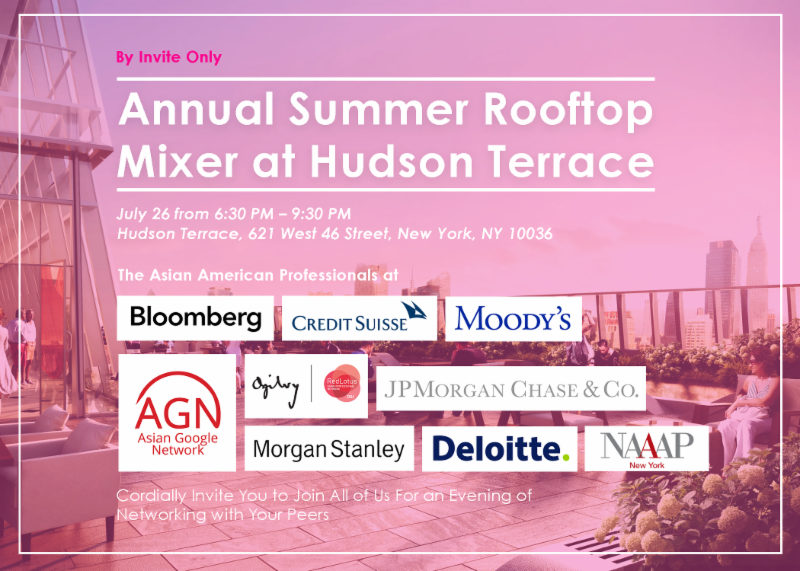 Join us for a special gathering at our Summer Networking Series at Hudson Terrace. This event is in collaboration with eight Fortune 500 Companies includingBloomberg, Credit Suisse, Deloitte, Google, JPM Chase, Moody’s, Morgan Stanley and Ogilvy. NAAAPNY is the exclusive non-profit organization working with these firms to bring a unique opportunity to network with like-minded Asian American Professionals at these respective firms. We expect 1,000 Asian American Professionals to join this event, so don’t miss out! Please do purchase your tickets in advance as we have a limited headcount for this event and tickets will sell out! You would not want to miss this.